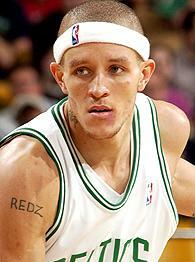 Delonte West is on our Fantasy Basketball team. He's been a very under-rated guy for us this year - helping us to the top of the standings currently. This being said - I'm a huge fan. It's hard not to be a bigger fan after reading this ESPN Article where he describes his vision of a perfect Valentine's Day date.